A horseman stands guard wi’ flag tae the sky. Hawick Common Riding is the first, and arguably the best, of the Border Festivals, and takes place annually in early June. It celebrates two important events in the history of the town – the capture of an English flag in 1514 by the young men of Hawick at Hornshole, about a mile and a half from the town, and the ancient tradition of riding the boundaries of Hawick Common. In May, on the recommendation of the two previous Cornets (now known as the Right and Left Hand Men) a young man is chosen as Cornet to lead the town’s celebrations. Although dating back much further, the first recorded Cornet was in 1703, and with the exception of the two world wars and a Foot and Mouth outbreak (2001) the line continues unbroken. A list of Cornets is displayed on a board situated at the Textile Towerhouse at the Heart of Hawick. In the Saturday and Tuesday of each week leading up to the Common Riding, the Cornet and his mounted supporters ride out to nearby villages and farms, the main rideout being the 24 mile round trek to Mosspaul. The Kirkin’, held on the Sunday prior to the Common Riding, where the Cornet and his followers walk to a local church for a service at which he gives a reading. The Morning Chases, where the Cornet and his supporters ride to St Leonards, just outside the town. The Thursday morning chase sees the Cornet carry the Town’s flag for the first time. The reception for Exiled Teries (a Teri being a native of Hawick), at which the many who return from around the world are welcomed by the Hon. Provost and Cornet and are entertained to an evening of local song and verse. The Colour Bussing, the most impressive and colourful of the many ceremonies, hosted by the Hon. Provost, at which the Cornet’s Lass busses the flag with blue and gold ribbons, before it is handed to the Cornet and he is charged return it unsullied and unstained after riding the marches. Local songs complement the evening, which also includes an address by a principal guest. The Riding of the Boundaries (Marches) takes place on the Friday, a day when the town unites in support of its history and tradition with a sense of community spirit rarely seen elsewhere. Mounted supporters have been counted well in excess of 300. The cavalcade stops at St Leonards where toasts are drunk and songs are sung, before making its way round the boundary of the Common to Hawick Moor where horse racing and a town picnic takes place. In the evening, following the return to the town, an official Common Riding Dinner is held, followed by the Common Riding Ball. Events on Saturday bring proceedings to a close, with a ride to Hawick Moor for a further race meeting, before a return to the town where the Cornet returns the flag to the Hon. Provost. 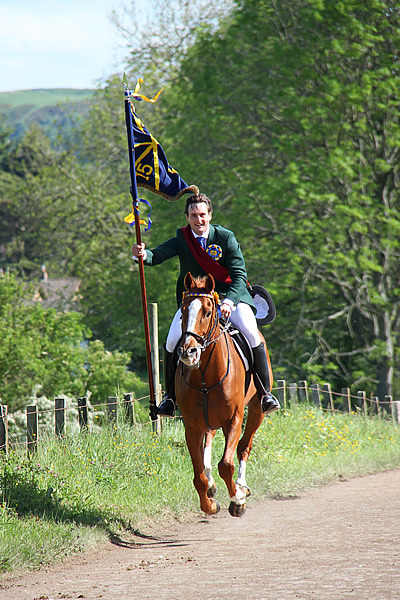 The image gallery below gives just a flavour of the drama of Hawick Common Riding. Images courtesy of ILF Imaging.